From the biggest booms to the quietest whispers, you'll experience every detail of your favorite games in stunning high fidelity 7.1 virtual surround sound via the PlayStation.4/PlayStation.3/PlayStation. Vita/PC Gold Wireless Stereo Headset. 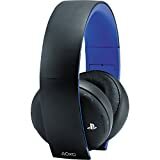 Plus, keep the chatter coming through the hidden noise-canceling microphone, and get access to custom game modes created by developers exclusively for PlayStation. with the Headset Companion App.